Soorwani enables new generation folk talents to sharpen their musical art among the familiar & local audience through Sangeet Reyan. Sangeet Reyan is a local musical performance providing platform to first timer or beginners young artists who have prospective musical art. Soorwani orgnizes this kind sangeet reyan once in a month inside the corners of the kutch. To create more opportunity & economical gain for master artists, Soorwani provides stage among intellectual audience at local level & national level as well. The list of above performances held during ge reporting period are as under. Soorwani ensures proper trainings of new generation artists in terms of basic soor & taal of singing. One day Basic Training on Soor & Taal was organized at Lohana Bhavan, Bhuj in which 25 artists were present. Mr. Chatursinh the musician & trainer has provided his services as resource person. Three days advanced training for 42 artists was organized at Bhuj. In this training Shri Deval Maheta, Musician provided the fruitful sessions over Taal, Aaalaap, Stage etiquettes and also suggested valuable inputs/correction by observing performance of each Mandali of Aaradhiwani that participated in the programme. 42 artists of various Aaraddhiwani mandlis were participated in this training. In this process Soorvani is working on different activities for preservation, digitalization & archiving of the Kutch music. Archiving & digitalization of 94 in-house material (DAT, CDs etc.) has been done. Towards the community based archiving of Kutch music, the interaction with JATT community is already finished the meetings at four different palaces like Tero Vandh, Ashirawandh, Jaalu & Dayapar. In these meetings relation of Music & Jatt community, songs & music related to their religion, life cycle and social traditions have been studied. Basic mapping of JATT artists has done. 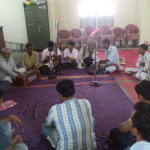 Three days in-house workshop with WAAI singers was organized to study and document the origin, history, traditions, practices, technical terms of DHAMBURA & high-low singing tones of WAAI group of Bhagadiya, Kutch.